The year 2010 was the centennial of the birth of the distinguished expatriate American writer and composer Paul Bowles, who was born 100 years ago―on December 30, 1910. Seven major Paul Bowles Centennial events were held in Seville, Spain; Cologne, Germany; Málaga, Spain; Lisbon, Portugal; Boston University in Massachusetts; five days of celebrations and events in Bowles' adopted home of Tangier, Morocco; and concluding with the University of California at Santa Cruz. A celebration was held in Tribeca in New York City, and radio programs were devoted entirely to Paul Bowles in Europe and America. A celebratory event honoring the life of Paul Bowles was held in Seville, Spain, on November 9, 10 and 11, 2009, during the sixth edition of the Seville European Film Festival (Sevilla Festival de Cine Europeo). This event reunited Vittorio Storaro, Jeremy Thomas, Richard Horowitz and other members of the film crew for a screening of The Sheltering Sky (El Cielo Protector), the 1990 adaption by Bernardo Bertolucci. This event occurred sixty years after the initial publication of Bowles' first novel in 1949. The Three Cultures Foundation collaborated in this Bowles Centenary event with additional screenings of several documentaries: Halfmoon (Halbmond)―a collection of three short films based on stories by Paul Bowles, "Merkala Beach", "Allal" and "Call at Corazón", presented by directors Frieder Schlaich and Irene Von Alberti; Maps of Sand and Water: The Life of Jane and Paul Bowles, presented by producer Javier Martín-Domínguez with the participation of Juan Cruz; and Tangier, That Old Lady, presented by writer and director Javier Rioyo. See the Seville Film Festival Web site and also an article in Le Journal de Tangier (in French). Festival Litcologne 2010 presented a special homage to Paul Bowles in Cologne, Germany on Saturday, March 20, 2010, during the annual Internationales Literaturfestival, Europe's largest literature festival. This event was broadcast over the radio in Germany in cooperation with the WDR 3 (West Deutscher Rundfunk) channel. Guests included Pociao and Roberto de Hollanda, Ulrike Haage and Michael Roes, and the program was moderated by Claudia Kramatschek and Michael Struck-Schloen. Homages to both Jane and Paul Bowles―"El mundo de los Bowles"―were held in Málaga, Spain from April 5–8, 2010 at the Instituto Municipal del Libro, Teatro Echegaray, Málaga, España. Among the events were readings from works by Jane Bowles and Paul Bowles, the introduction of two new books by and about Jane Bowles: Jane Bowles: últimos años (1967–1973), Rodolfo Häsler, editor. (Málaga, España: Consulado del Mar, Instituto Municipal del Libro, Áero de Cultura. Ayuntamiento de Málaga, 2010) Bilingual Edition. And Una Pareja en Discordia, introducción y traducción Luis García de Ángela (Málaga: Instituto Municipal del Libro, Áero de Cultura. Ayuntamiento de Málaga, 2010), screenings of several films, discussions and presentations. A special homage to Jane Bowles was also held at the Cementerio de San Miguel in Málaga where she is buried. (Jane Bowles died in Málaga in 1973.) Many personalities from the Spanish world of culture and literature attended this event which the director of the Generación del 27 cultural center, Aurora Luque, described as a "moment to meditate". Francisco de la Torre, the mayor of Málaga, was also in attendance and described the homage as "an obligatory recognition". A new piece of black granite highlights Jane Bowles' resting place. The Municipal Book Institute, IML, arranged the events in honor of the two writers. Participants included María Victoria Atencia, Jesús Aguado, Álvaro García, Rodolfo Häsler, Aurora Luque, María Navarro, Alfredo Taján, Juan Zaro, Miguel Briones, Carlos Pranger, Antonio García Maldonado, Jorge Herralde, Vicente Molina Foix, Ana María Häsler, Enrique Bernáldez de Quirós, Charo Ema, Pepe Cárleton Abrines, Ruth Fainlight, Francisco Chica, Tamara Dragadze, Marta Pessarrodona, Rachel Muyal, Javier Rioyo, Juan Cruz, Javier Martín-Domínguez, Richard Horowitz and Miquel Barceló. Do you Bowles?―an academic conference and three-day centennial celebration for Paul Bowles was co-organized by Anabela Duarte and Hermínia Sol and hosted by the American Studies Research Group at the University of Lisbon Centre for English Studies (ULICES / CEAUL), in Lisboa, Portugal, on October 21–23, 2010. The plenary speakers included Allen Hibbard, Christopher Sawyer-Lauçanno and Irene Herrmann. Other participants were: Robert Samuels; Francis Poole and Timothy Murray from the University of Delaware Library; Javier Martín-Dominguez; filmmaker Karim Debbagh, who presented his documentary Creating a Legend; filmmaker and writer Regina Weinreich; Abdellah Karroum; composer Richard Horowitz; filmmaker Sara Driver, who presented You Are Not I, a film she directed in 1980, based on Bowles' short story; Iranian-born singer Sussan Deyhim; John Havelda; Dr. Brian T. Edwards; Ana Maria Freitas; António Costa; Daniel Blaufuks; and Lourdes Féria. On October 23th, a concert of Paul Bowles' Seven Latin American Pieces was performed by António Rosado, and art-songs of Bowles' Blue Mountain Ballads were sung by Anabela Duarte and played by Irene Herrmann. For further details: Do you Bowles? Boston University, College of Fine Arts, in Boston, Massachusetts hosted a Bowles Centennial Celebration entitled "Paul and Jane Bowles: Two Stars in the Desert", with musical and dance performances and readings on Saturday, October 30, at 8:00 PM. Allison Voth and Jim Petosa, artistic directors; Allison Voth, Bill Lumpkin, Jeffrey Stevens, music directors. Special events included the rarely heard opera Yerma on October 16–17 and 22–23, the play In the Summer House by Jane Bowles (October 7), documentary and movie screenings, panel discussions, Bowles’ seldom-heard chamber works, songs with Jane Bowles’s lyrics, Paul Bowles' dance works and solo pieces juxtaposed with readings of both Jane and Paul Bowles' works, performed and read by members of the Schools of Music and Theatre faculty and students. These Bowles Centennial activities at Boston University were a major part of the 14th annual Fringe Festival. A wide range of Paul Bowles Centennial activities were held in Tangier for five days, October 27–31, 2010, to commemorate the 100th year anniversary of the birth of writer and composer Paul Bowles, who lived 52 years in Tangier. In tribute to Paul Bowles, the Tangier American Legation Institute for Moroccan Studies, (T.A.L.I.M. ), in the medina, presented a new exhibition showcasing the Paul Bowles Moroccan Music Collection from the Library of Congress in Washington. Among the items included in the exhibition were 18 photographs taken by Bowles in 1959–1962 during his extensive travels throughout all of Morocco to tape-record indigenous music, along with his accompanying texts and notes. Gerald Loftus, TALIM's new director, inaugurated the Paul Bowles Wing in the historic property―now two adjacent rooms, expanded from the original Paul Bowles Room―and new Bowles-related items are now on permanent display. The Moroccan music that Paul Bowles recorded fifty years ago for the Library of Congress―the Paul Bowles Moroccan Music Collection―is being digitized and will be made permanently available for all in the Tangier American Legation Institute for Moroccan Studies (TALIM)―a museum, conference and cultural center. This digitization was made possible by a grant from the U.S. Embassy in Rabat, Public Affairs Office, with additional funds raised by the Wilaya de Tanger and Royaume du Maroc, Ministère de la Culture. Several new books, Travels: Collected Writings, 1950–93 (Sort Of Books, London, 2010), and a new French edition of Too Far from Home, La Boucle du Niger, with drawings of Mali by Miquel Barceló (Paris: Éditions Eric Koehler, 2010), among others, were featured and available for sale at Librairie Les Insolites, Page et Plume and the Tangier American Legation bookshop. Instituto Cervantes de Tánger sponsored and presented many events, and Cinémathèque de Tanger screened six films and one audiovisual presentation. On Wednesday, October 27, at 6:30 P.M. at the Cinémathèque de Tanger (Cinéma Rif), at the Grand Socco (Place du 9 Avril), screened Mapas de agua y arena: las vidas de Jane and Paul Bowles (Traces of Sand and Water: The Lives of Jane and Paul Bowles), a documentary film produced by Javier Martín-Domínguez, who was present at the screening along with the composer Richard Horowitz (sponsored by Instituto Cervantes de Tánger), followed at 8:30 P.M. with a screening of Un thé au Sahara, Bernardo Bertolucci's 1990 film adaptation of Paul Bowles' novel The Sheltering Sky, starring Debra Winger and John Malkovich, with cameo appearances and some narration by Paul Bowles. On Thursday, October 28, from 10:00 A.M. to 1:30 P.M., a symposium entitled "Todo lector es un traductor" ("Every reader is a translator") was held at l'École Supérieure Roi Fahd de Traduction, Route du Charf. It was moderated by Malika Embarek, with the participation of translators Claude Nathalie Thomas, Abdelaziz Jadir and Nicole d’Amonville Alegría, and Italian writer Umberto Pasti. The symposium was co-sponsored by Instituto Cervantes de Tánger. On Thursday, October 28, at 2:30 P.M. and at 7:30 P.M., Cinémathèque de Tanger screened the documentary film Paul Bowles in Morocco, produced in 1970 by Gary Conklin. On Thursday, October 28, at 4:00 P.M., The American School of Tangier presented unique archival materials from the nine theatrical collaborations between Paul Bowles and Joseph A. McPhillips III, including recordings, music scores, photos, and letters from several of these works. In addition, the school presented a live-action revival of Jane Bowles' puppet play A Quarreling Pair (which AST first presented along with "Camp Cataract" in 1984). The play features two Paul Bowles compositions. The program also included other performed selections from Paul Bowles's oeuvre, and viewed the Claudio Bravo portrait of Bowles. On Thursday, October 28, at 6:30 P.M., Instituto Cervantes de Tánger opened an exhibition of photographs entitled "Los años dorados: Paul y Jane en Tánger", at Instituto Cervantes, Sala de Exposiciones (9, Rue Belgique, near the Place de France). The exhibition continues until November 13, 2010 and is open daily except Monday, from 11:00 A.M. to 1:00 P.M. and from 4:00 P.M. to 9:00 P.M. The photographs were taken by Pepe Carleton, Emilio Sanz de Soto, Rachel Muyal, Tessa Codrington, Cherie Nutting, and Philippe Lafond. The exhibition was presented in partnership with Ayuntamiento de Málaga, l’Instituto Municipal del Libro de Málaga. On Thursday, October 28, at 8:30 P.M., Instituto Cervantes de Tánger presented "Concierto de Ana Hásler: Paul Bowles y España", a musical performance of songs composed by Paul Bowles, sung by soprano Ana Häsler, with pianist Enrique Bernaldo de Quirós. This concert was held at Colegio Español Ramón y Cajal, Salón de Actos, at 81, Avenue Habib Bourghiba, near the Place de Kowéit ("Iberia"), and was co-sponsored by the Spanish Embassy in Rabat and the City of Málaga, Spain. On Friday, October 29 at 10:30 A.M. (meeting place: Place de la Kasbah; in front of Dar Zero), there was a literary walk led by Rachid Tafersiti, the Moroccan writer and Tangérois whose latest book Retour à Tanger was published in 2009 by Éditions Koutoubia in Paris. Monsieur Tafersiti led a group of about 50 people from the kasbah to the small house in the upper medina off rue Amrah that was the home of Paul and Jane Bowles from 1948 until 1956. And at 11:30 A.M. (meeting place: the parking lot in front of the Kortobi Hospital), a second literary walk occurred, also led by Rachid Tafersiti, to the Menebhi Palace on the Marshan that was the inspiration for a major scene in Bowles' novel Let it Come Down. Inside the Menebhi Palace, Claude Nathalie Thomas read a story written by Mohammed Mrabet called "Two Friends and the Rain", along with a passage from Let It Come Down. On Friday, October 29 at 2:30 P.M., people gathered at the Tangier American Legation (TALIM) in the medina for the inauguration of the Paul Bowles Wing and to view new items on display including photographs, maps and notes related to the Paul Bowles Moroccan Music Collection from the Library of Congress, and to learn about the recordings of indigenous Moroccan music that Bowles tape-recorded during his travels throughout Morocco in 1959–61. On Friday, October 29 at 4:00 P.M., a multilingual tea for friends of Paul Bowles was given at the Hôtel Continental on Dar Baroud in the medina (a location for the film adaptation of The Sheltering Sky), hosted by Claude Nathalie Thomas. There were also readings in French, Arabic, English and Spanish of a text by the Moroccan playwright Zoubeir Ben Bouchta about the artist Ahmed Yacoubi. On Friday, October 29 at 6:30 P.M. at the French Consulate (2, Place de France), Jean-Yves Berthault, the French Consul Général in Tangier, hosted a reception (by invitation only), and he read excerpts from Bowles’s fiction in French, with readings in English by actor and film director Sean Gullette, and readings in Spanish by the poet Rodolfo Häsler. The French Consul Général invited The Master Musicians of Jajouka led by Bachir Attar to perform, and there was also an exhibition of photographs of Paul Bowles by Daniel Aron. On Friday, October 29 at 7:00 P.M., the Instituto Cervantes de Tetuán, (13, rue Chakib Arsalane in Tétouan), presented a concert of songs composed by Paul Bowles, sung by soprano Ana Häsler, with pianist Enrique Bernaldo de Quirós. On Friday, October 29 at 8:30 P.M. the documentary film Let It Come Down: The Life of Paul Bowles by Jennifer Baichwal was shown at Cinémathèque de Tanger (Cinéma Rif). On Saturday, October 30, at 11:00 A.M, a round table was held in the Instituto Cervantes' Biblioteca Juan Goytisolo (9, Rue Belgique), entitled "Paul Bowles y España", organized by the Instituto Cervantes and the Instituto Municipal del Libro de Málaga, to discuss the intimate relationship between Paul Bowles and Spain: Bowles' knowledge of Spanish geography, musical compositions inspired by Federico García Lorca’s works, Spanish friends, proficiency in the Spanish language, the success of Paul Bowles books in Spain, the importance of the Bowleses in Málaga, and a discussion of the Puerta Oscura literary review. This event was moderated by Javier Rioyo, with the participation of Francisco Chica, Rodolfo Häsler, Pepe Carletón, Vicente Molina Foix and Alfredo Taján. On Saturday, October 30, at 2:30 P.M., and again at 7:30 P.M., The American School of Tangier (149, Rue Christophe Colomb) screened the documentary film, Paul Bowles in Morocco, produced in 1970 by filmmaker Gary Conklin. On Saturday, October 30 at 4:00 P.M., Librairie Les Insolites bookshop (28, rue Khalid Ibn Oualid, ex-Vélasquez, near the Place de France), presented an exhibition of portraits of Paul Bowles entitled "Quatre Regards pour un seul homme" ("Around Bowles"), by four photographers: Daniel Aron, Roland Beaufre, Philippe Lafond and Gérard Rondeau (in association with Galerie 127 and Nathalie Locatelli). The French actress, writer and director Emmanuelle Grangé read a selection of writings of Paul Bowles. A selection of books by Paul Bowles were available for sale. On Saturday, October 30 at 5:00 P.M., at Page et Plume bookshop (3, rue El Hariri, near Place des Nations), presented a new edition of La Boucle du Niger (Too Far From Home), that was recently republished by Éditions Éric Koehler in Paris, with a new preface written by Claude Nathalie Thomas, who also translated the book. Madame Véronique Koehler was present to discuss this book and the decision by her husband Éric Koehler, a friend of Paul Bowles, to republish it. Other Paul Bowles books in English, French and Spanish were presented and available for sale. On Saturday, October 30, at 6:00 P.M., at Musée de la Kasbah, Dar el Makhzen, Place de la Kasbah, the Librairie des Colonnes hosted an exhibition, "Bowles in the Casbah", of a selection of Paul Bowles' own photographs. In addition, there was an exhibition of paintings by the Moroccan artist and storyteller Mohammed Mrabet, who collaborated with Paul Bowles for many years and who was also present at this exhibition, and there was a dramatic reading of letters of Jane and Paul Bowles directed by Éric Valentin. A special issue of Nejma, a literary journal edited by Simon-Pierre Hamelin, was presented to commemorate the Paul Bowles Centennial. This exhibition was co-sponsored by Délégation du Ministère de la Culture à Tanger. On Saturday, October 30 at 8:00 P.M. at the Salle Beckett (Rue Okba Ibn Nafie), L’Institut Français de Tanger presented a staged reading by the French actress and comedienne Nine de Montal, of Paul Bowles' "L'éducation de Malika” ("Here to Learn"), directed by Laurent Fréchuret, director of Centre Dramatique National de Sartrouville. On Sunday, October 31, at 4:00 P.M. at the Cinémathèque de Tanger (Cinéma Rif), at the Grand Socco (Place du 9 Avril), there was an audiovisual presentation, Déjala que caiga by Oscar Marin Centeno, created in 2009 from stock photos, text and music by Paul Bowles on Jane Bowles' last year in Málaga. And at 7:30 P.M. there was a screening of the documentary film Creating a Legend by Karim Debbagh, followed at 8:15 P.M. by screening of the film Un américain à Tanger, produced in 1993 by Mohamed Ulad Mohand. Thanks to: Tanger Pocket Guide and Mark Holbrook, director of the American Language Center (ALC) in Tangier, for publicity; and Gerald Loftus, the new director of the Tangier American Legation Institute for Moroccan Studies (TALIM), for his diligent work in initial planning of events and for establishing and preparing the new Paul Bowles Wing, and also thanks to Mohammed Jadidi and Marie Hélène Loftus. Further thanks to: Jean-Yves Berthault, the French Consul Général in Tangier; Cecilia Fernández Suzor, director of Instituto Cervantes de Tánger for her diligent efforts in planning, coordination and sponsorship of various centenary events; Ministère de la Culture d'Espagne; Yto Barrada, founder and director of Cinémathèque de Tanger; Simon-Pierre Hamelin, manager of Librairie des Colonnes; Éric Valentin; Le Musée de la Kasbah; Délégation du Ministère de la Culture à Tanger; writer and journalist Jamal Amiar for additional publicity; filmmaker and producer Karim Debbagh of Kasbah Films; Ayuntamiento de Málaga, Instituto Municipal del Libro; headmaster Dr. Brian Horvath, Oliver Orion White and students of The American School of Tangier; filmmaker and producer Javier Martín-Domínguez; composer and writer Phillip Ramey; Pepe Carleton; Stéphanie Gaou-Bernard of Librairie Les Insolites; Nathalie Locatelli; Véronique Koehler of Éditions Koehler (Paris); Emmanuelle Grangé; Barbara Temsamani; Elena Prentice; L'Institut Ramon Llull (Baléares); the photographer Cherie Nutting, who collaborated with Paul Bowles on Yesterday's Perfume: An intimate Memoir of Paul Bowles. And last but not least, we are most grateful to Claude Nathalie Thomas, a longtime friend of Paul Bowles and his preferred French translator, who enthusiastically initiated these Paul Bowles Centennial events in Tangier. 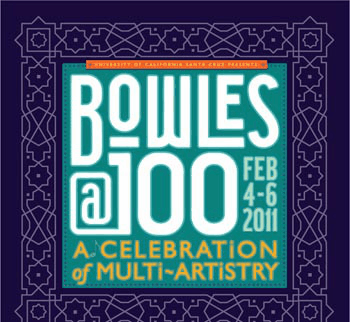 The University of California at Santa Cruz hosted "Bowles at 100: A Celebration of Multi-Artistry" on Friday, Saturday and Sunday, February 4–6, 2011. There was a series of panel discussions with scholars, writers and filmmakers, three concerts, a photographic and art exhibit, and film screenings exploring the life and works of American writer and composer Paul Bowles (1910–1999). "Paul Bowles in Black and White" was held at the Eloise Pickard Smith Gallery, Cowell College, UCSC, from January 18, 2011 through March 12, 2011. The seventh and last Paul Bowles Centennial event, "Paul Bowles at 100: A Celebration of Multi-Artistry" was held at the University of California at Santa Cruz on February 4–6, 2011. On Friday, February 4th, 2011, at 6:00 P.M., Ensemble Parallèle, a contemporary opera ensemble, performed three musical works by Paul Bowles. Choreographer Tandy Beal joined the ensemble for this occasion. A Paul Bowles chamber music and spoken word concert―a John Dizikes Music Event―featuring The Ariose Singers, a choral ensemble conducted by Michael McGushin, performed on Sunday, February 6, 2011, at 11:00 A.M., in the Cowell College Music Recital Hall. There were several world premieres of Paul Bowles' compositions during this Bowles Centennial celebration at UCSC in Santa Cruz. The introductory remarks were given by Tyrus Miller and Irene Herrmann, and the keynote presentations were given by novelist and biographer Edmund White and filmmakers Karim Debbagh and Frieder Schlaich. Participants included: Margaux Cowden, Karim Debbagh, Millicent Dillon, Sara Driver, Brian Edwards, Jimmy Fazzino, Irene Herrmann, Allen Hibbard, Timothy Mangan, Jeffrey Miller, Tyrus Miller, Timothy Murray, Francis Poole, Frieder Schlaich, Philip Schuyler, Edmund White, Rob Wilson, and Michael Wolfe. This Paul Bowles Centennial celebration was sponsored by the National Endowment for the Arts, Institute for Humanities Research, Porter College, Cowell College, Office of Research, Division of the Arts and Division of Graduate Studies. Administrative support was provided by the University of California Santa Cruz, Institute for Humanities Research. See the "Bowles at 100" Web site for complete program information and schedule of events in Santa Cruz. In addition to the seven major Paul Bowles Centennial celebrations, several radio programs were broadcast about Bowles. In Switzerland, Schweizer Radio, SR DRS 2, presented a 52-minute tribute to Paul Bowles on December 17, 2010, with Franziska Hirsbrunner. Listen to this program, in German: "Der Künstler als Summe seiner Widersprüche". On December 30, 2010, on what would have been Paul Bowles' 100th birthday, German radio WDR 3 broadcast nationally a special program entitled "Nichts außer Himmel und Sonne" ("Nothing but Sky and Sun"), with Roberto de Hollanda. Among other birthday tributes was an article in The Huffington Post, "Remembering Paul Bowles", by writer Regina Weinreich, the co-producer–director of the documentary film Paul Bowles: The Complete Outsider; and "Der Fremde im Glück" in the Berlin, Germany newspaper Der Tagesspiegel. "Paul and Jane Bowles: Two Stars in the Desert"
Most recently, at 8:00 P.M. on Friday, March 11, 2011, "Paul and Jane Bowles: Two Stars in the Desert", an evening of music and theatre, was presented by the Boston University, College of Fine Arts, featuring faculty and students from the School of Theatre, the School of Music and The Opera Institute. This event was presented as part of the InCite Arts Festival, held at the Borough of Manhattan Community College's BMCC Tribeca Performing Arts Center at 199 Chambers Street in New York City. The artistic directors were Allison Voth and Jim Petosa. Mr. Petosa is also the Artistic Director of the InCite Arts Festival. The ambitious 90-minute program began with a recorded rhaita call played by Bachir Attar, the leader of the Master Musicians of Jajouka, followed by an excerpt from Millicent Dillon's book You Are Not I: A Portrait of Paul Bowles read by Alex Morgan. Next came a performance by Allison Voth of Bowles' Three Miniatures for Piano (Prelude, "Guyanilla" and Prelude for Bernard Saurès). An ensemble then performed The Wind Remains, a zarzuela for tenor, mezzo-soprano and chamber orchestra, based on Federico García Lorca's surrealist drama Así Que Pasen Cino Años. This was followed by an excerpt from the play In the Summer House by Jane Bowles read by Lily Narbonne and Alex Morgan. Two Paul Bowles songs with lyrics by Jane Bowles, "Farther from the Heart" and "My Sister's Hand in Mine" were sung by soprano Chelsea Basler and accompanied by pianist William Lumpkin. This was followed by a performance of Music for a Farce, its instrumental movements interspersed with readings, by Lily Narbonne and Alex Morgan, from Paul Bowles's book Points in Time, after which Jim Petosa read an excerpt from the novel Let It Come Down. This memorable Bowles celebration concluded with a performance of Concerto for Two Pianos, Winds and Percussion, conducted by Zachary Bruno, with pianists Michelle Alexander and Pei-Yeh Tsai. Allison Voth is assistant professor of music at Boston University and principal coach at BU's Opera Institute. A specialist in the music of Paul Bowles, in 1992 she produced and performed in a multimedia presentation, Paul Bowles: One Man, Two Voices, at Merkin Hall in New York City. In September 1995, at The New School, Voth premiered a set of piano preludes as part of the EOS Ensemble's Bowles Festival in New York.